Sensor Instruments GmbH: Especially the counting of transparent, stacked plastic caps, as they for example frequently are used in the packing industry, usually is a highly problematic application because on the one hand the edges of individual caps are not always exactly aligned, and on the other hand copy counters that work with the reflected-light principle do not provide a reliable counting result especially with transparent objects. Now, however, the A-LAS-N-F16-9.5x0.8-150/80-C-2m laser transmitted-light sensor in combination with the SPECTRO-1-CONLAS control unit performs this application task without any problems. The approx. 9.5mm wide and 0.8mm high laser light strip is partially covered by the edges. 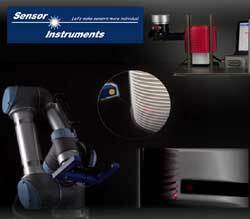 If the laser fork sensor is moved along the stack, for example by a linear unit or a robot, the laser light curtain is partially covered. The degree of covering of the laser light strip increases when an edge is reached, whereas between the edges the level of covering of the laser spot is lower. Due to the transmitted-light method transparent objects show the same behaviour as non-transparent materials. By means of an alternating signal sequence and differential signal evaluation in the SPECTRO-1-CONLAS control unit the edges are accurately detected even if the stack shows a wave shape. The high scan frequency of the sensor system of typ. 100kHz no doubt is of great advantage here. Furthermore, special algorithms such as the dynamic dead time prevent multiple counting of edges. When an edge is detected a digital signal (0V/+24V signal level) is provided at the output of the control unit. With the Windows® software that is included in the delivery the sensor system can be easily parameterised and monitored at the PC through the serial interface, inclusive of a digital scope function that shows the signal characteristics quasi in real time. Depending on the object size and on the available space, various fork sizes and laser light curtains are available. The forks feature a robust aluminium housing, and the optics covers are made of scratch-resistant glass.